"Umbaukit für Automatikgetriebe Overdrive 2 550Lb-ft"
A truly complete conversion, combining the Keisler PerfectFitTM transmission system with all of the correct matched accessory parts that have been carefully selected and tested by Keisler for guaranteed quality and performance. Drivetrain component selection and installation instruction and support is critical to get the job done right. 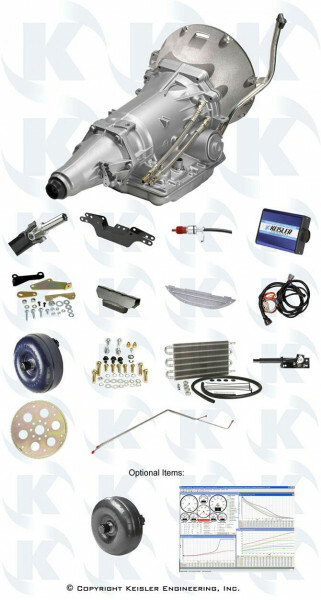 Rest assured, buying from Keisler - the leader in overdrive transmission systems - is the first step in the best driving improvement you will make to your Mopar E-Body. Bonus: You can hold 1st gear by pulling the lever into 1, and get awesome launch control! 2. LOCK UP TORQUE CONVERTER - Electronically controlled to give you lower RPM’s, longer transmission life and quicker reaction to your right foot! 3. FLEX PLATE - SFI-approved flex plate with correct balance and bolt pattern for your particular application. 4. CROSSMEMBER - Heavy-duty formed steel, MIG welded box construction with zinc coated finish. 5. ISOLATOR - Heavy-duty rubber isolator, polyurethane upgrade available. 6. TRANSMISSION CONTROLLER - Compact plug and play unit pre- programmed to match your driving style. Intelligent computer monitors your throttle and vehicle speed to provide transmission performance that meets your demands - from easy cruise with softer shifts - to tire blazing, spine tingling firm shifts - all in one transmission solution. The best of both worlds - comfort and performance! 7. DRIVESHAFT AND SLIP YOKE - Lightweight high strength steel, automatic welded and computer dynamic balanced with premium solid sealed U-joints and heavy-duty Spicer slip yoke, painted satin black, certified and serialized. Built in-house on Hines driveshaft manufacturing cell for the ultimate in quality and craftsmanship! 8. THROTTLE POSITION SENSOR (TPS) - Bolt-on unit provides throttle feedback to computer with just 3 wires. Eliminates the woes of yesteryear’s technology, such as mechanical kick-down linkages or Throttle Valve (TV) cables, which can be difficult to adjust by trial-and-error and will cause transmission damage if not adjusted properly. 9. SPEEDOMETER OUTPUT - Mechanical speedometer cable and correct driven gear, calibrated for your vehicle's tire size and differential ratio. 10. PLUG & PLAY HARNESS - Simple to install with all weather tight, modular connections. 11. SHIFTER CONVERSION KIT - Includes all necessary parts to convert your original 3-speed automatic shifter to a 4-speed shifter. Retains the original shifter handle, console, and top plate for a factory-original look. 12. LOCKING DIPSTICK AND TUBE - Original Equipment style; Dress-up options available. 13. PRE-BENT STEEL COOLER LINE SET - Replaces the factory lines. 14. INSTALLATION HARDWARE - High strength Grade 5 and 8 fasteners, properly sorted, bagged and labeled for easy reference. Everything you will need - no trips to the local hardware store required! 15. AUXILIARY TRANSMISSION OIL COOLER - Stage 2 and Stage 3 transmissions come with a high-performance auxiliary transmission oil cooler to help meet the demands of higher horsepower engines. 16. INSTALLATION MANUAL - Easy to understand, highly illustrated instructions for a smooth installation.